typhoon nabi is overhead, barreling over a neighbouring island, but still bringing some nasty, nasty weather. i still have to go to work, bleah. of course, this is just a nuisance storm, nothing like what's going on in the mainland. if you know anyone who is looking for an (albeit rudimentary) emergency information database for katrina, the fine tsunami help folks have set one up at www.katrinahelp.info. take care y'all. 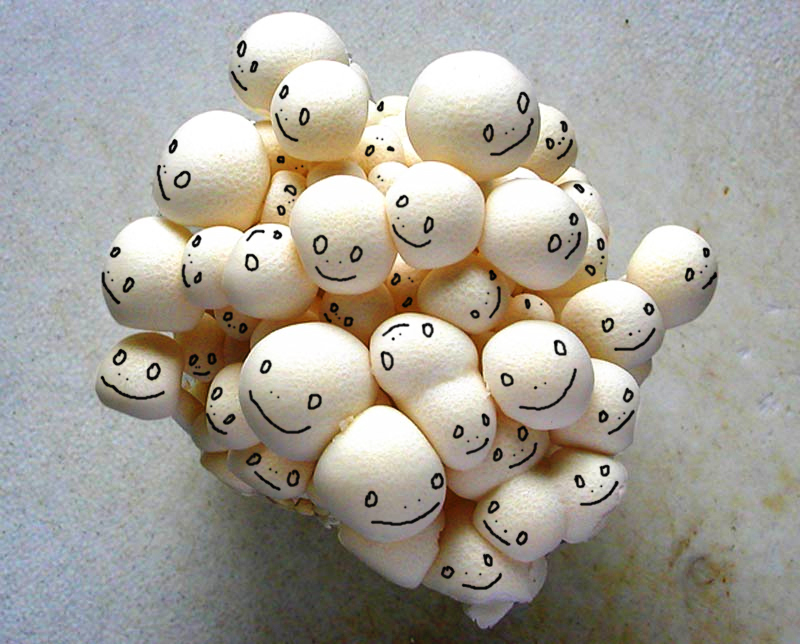 your typhoon-battered (no not tempura-battered) brethren wish you the best. back to the old house. my family is from pampanga, about an hour away from manila, under the volcano. it has been a couple of years since i'd last been there, and since then, my mom's family has restored their parents' home. the house dates back to the twenties, a modest example of the bahay na bato-style provincial home that was prevalent at the time, but is rapidly disappearing. (for a more grand example, one only needs to look next door.) i spent a lot of time in the kitchen with my grandmother, and i was glad to see it (and the rest of the house) is almost exactly as i remember it, only with the distinct difference of it actually looking less run down now than then. 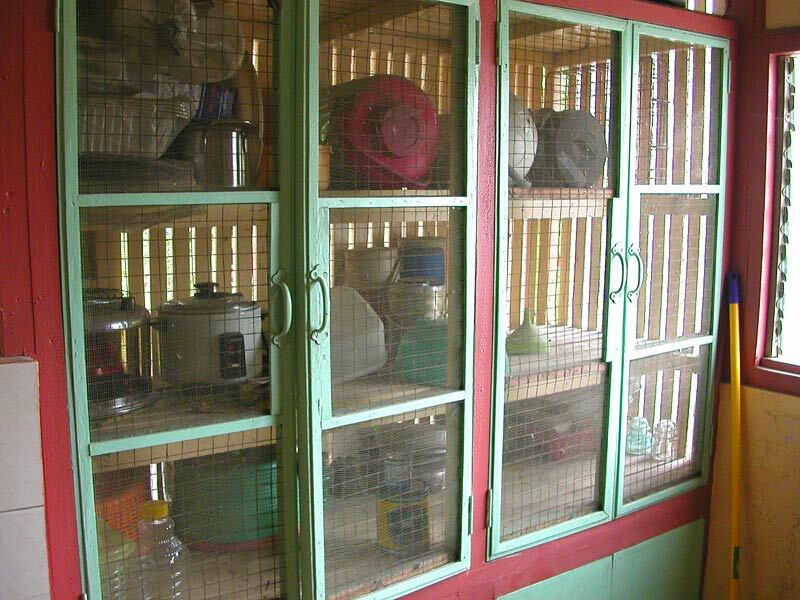 i particularly remember this aparador, or food "safe", where cooked foods were stored, pre-refrigeration days--the screened-in doors and the back-slatted box hanging off the windowsill allowed for proper air-circulation to keep foods from spoiling. if it wasn't a complete impracticality in today's world (how do you keep someone from breaking in? what if there's a typhoon? ), i would definitely add one of these to my "dream kitchen". more photos of the old house. manila: dinner at museum café. our first night there we decided to walk across the street to greenbelt, which houses over a hundred restaurants and food outlets. 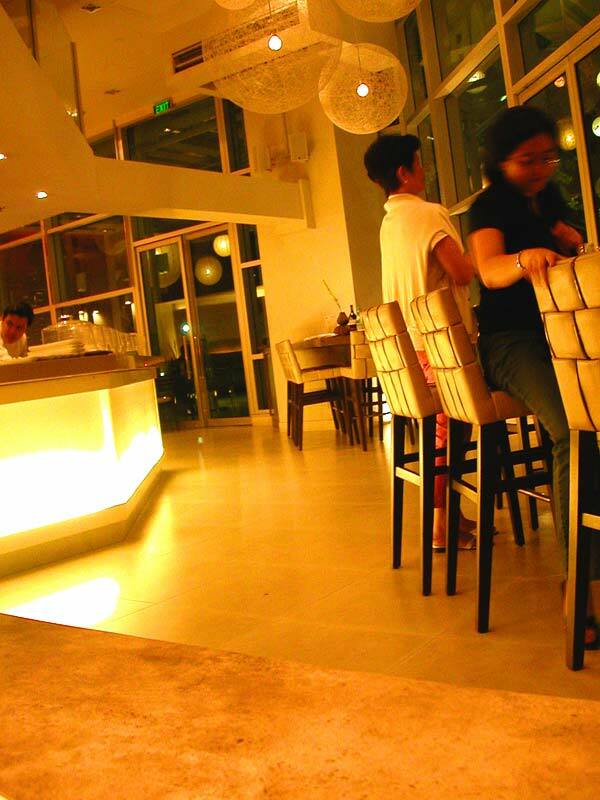 we were looking for something good (obviously) and possibly not too crowded on an early weekend night, so mariel suggested we try museum café--or m café as it is informally known--attached to the ayala museum. oh hippy hippy shake, this place reeks of hipness, with concrete floors and tables, white walls and glass, and giant spun thread globe lights overhead. the staff members are jordi labanda illustrations come to life, and the crowd all johnny cashed-out dressed in black. it is slightly intimidating, but in the breezeway between the museum and café there is a lovely outdoor seating area--all candle- and fairylights- lit, with gentle bossanova and chillout music wafting through the trees; along with the relative lack of attitude on the staff's part (just a "we're not snobby, we're really just not here" space-out that passes for discreet), and the row of obscenely luscious desserts on the counter that greets you when you first walk in, m is more inviting that your standard artsy white box. 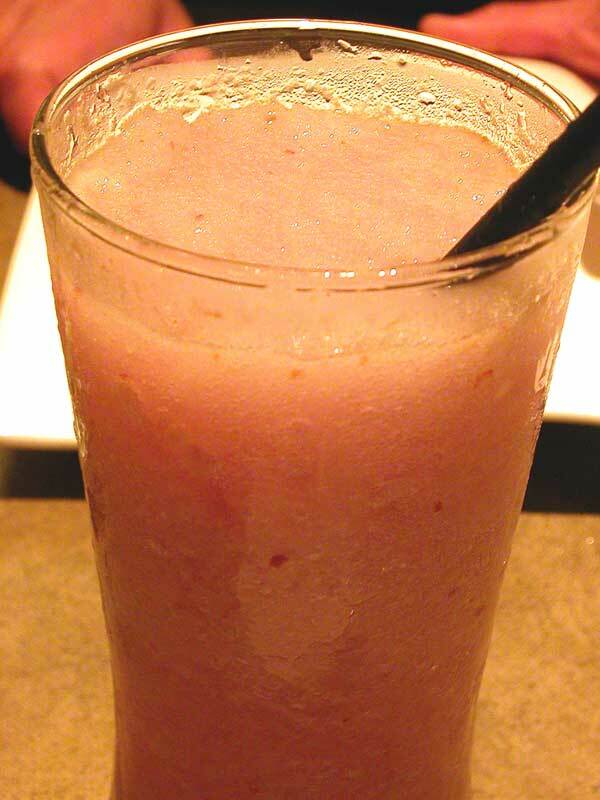 like many restaurants in manila, there is usually some sort of fruit shake (made by blending fresh fruit and ice together) on the menu, quite refreshing in the tropical heat. m has the typical ones--green mango, melon, and calamansi--but a couple of unusual ones as well. i had one made from duhat and lychee, which was sweet and delicate. 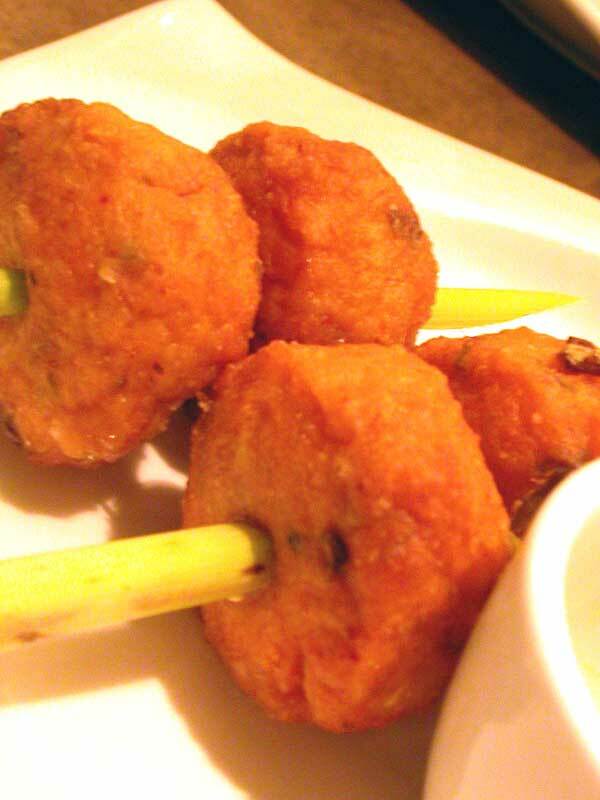 we started with codfish balls skewered on lemongrass, and duck rolls with hoisin sauce. i don't remember what kind of sauce was served with the fried cod, but they were flavourful and almost uncomfortably meaty for fishballs. unlike other processed fish products there were noticeable chunks of cod throughout, and the frying sealed in its juiciness. the duck rolls were flour tortillas filled with skinless dark duck meat, julienned carrots, radish, cucumbers, and lettuce, and were quite light and fresh. there was definitely more vegetables than duck meat (i thought it could've stood to have a little more duck), but the meat was tender and not stringy. 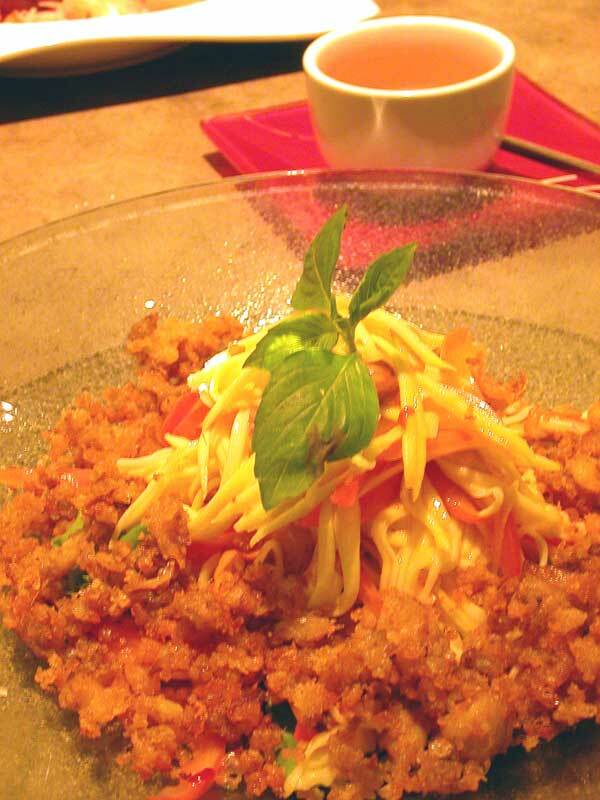 they were served with a side of tasty, ungreasy kropek, a type of airy, crispy prawn chip. i shared an order of the pumpkin curry soup, which was a coconut milk-based soup with puréed pumpkin and a light indian-style curry spice. it was served with a poppadom (a chickpea flour crispbread) on the side. i found the soup to be nicely spiced, not overwhelming the pumpkin. it was perfectly pleasant, but truthfully, i didn't find it especially exciting--maybe a little more kick would've knocked my fussy boots off. i was also slightly underwhelmed by my green mango salad with fried catfish. i was expecting the catfish to come in larger pieces, but it turned out to be catfish flakes that were fried in a batter, like fish-flavoured bacon bits. they were crunchy but not hot, and while the rest of the salad was the same slightly-above-roomish-temperature (as expected), i think if the catfish bits were a little warmer then the flavour of the fish would have improved. however, there was a generous amount of catfish, not-too-sour julienned green mango, and the whole dish was balanced out by the chopped cashews, tomatoes, and green onions with a sweet and sour vinaigrette. 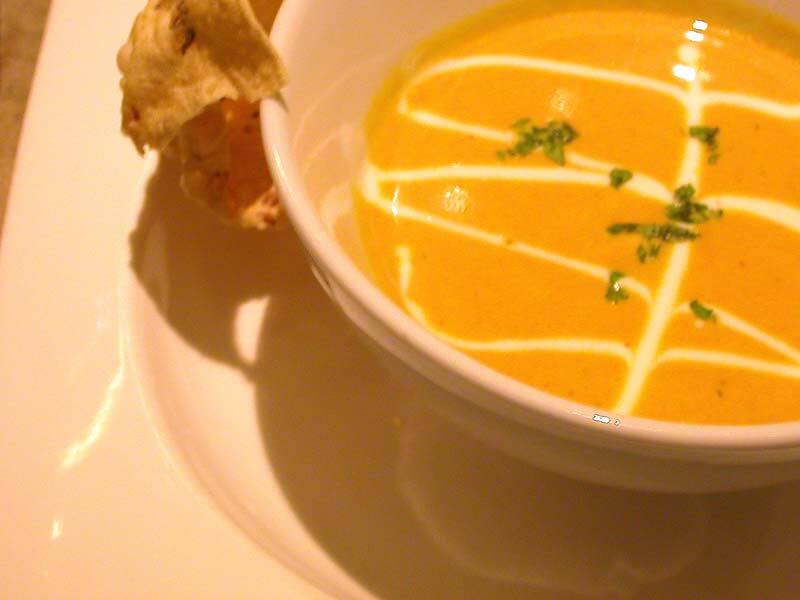 the dish turned out to be an excellent palate cleanser for the rich pumpkin curry soup. i was definitely having a case of food envy, as my companions' dishes looked more interesting and seemed to satisfy them more than mine did. i tried the seared scallop and pomelo salad, which had a nice amount of sweet scallops, pomelo segments, cashews, and mint amidst the lettuce and the patis (fermented fish sauce)-spiked dressing. 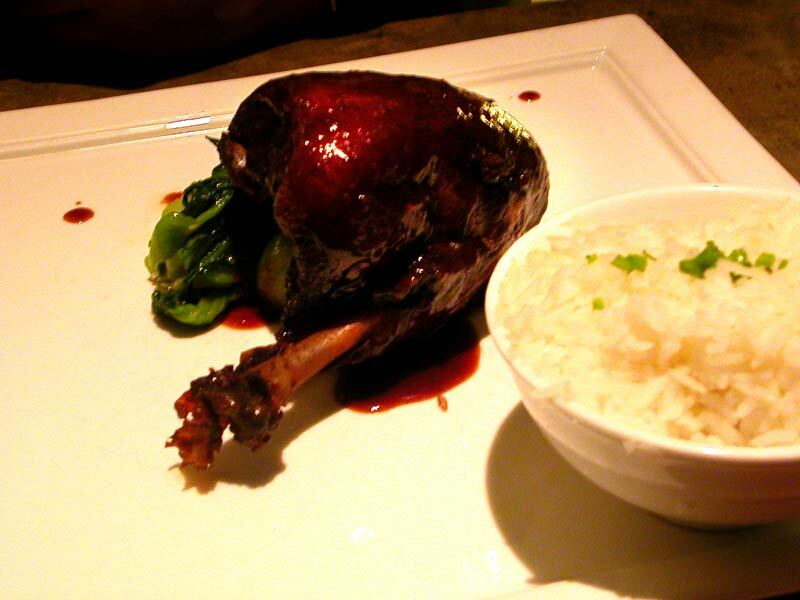 i also had a bite of the succulent asian five spice marinated duck (which was described as duck breast on the menu, but actually was a duck leg). it was served on a bed of sautéed kangkong (water spinach), with a side of rice. 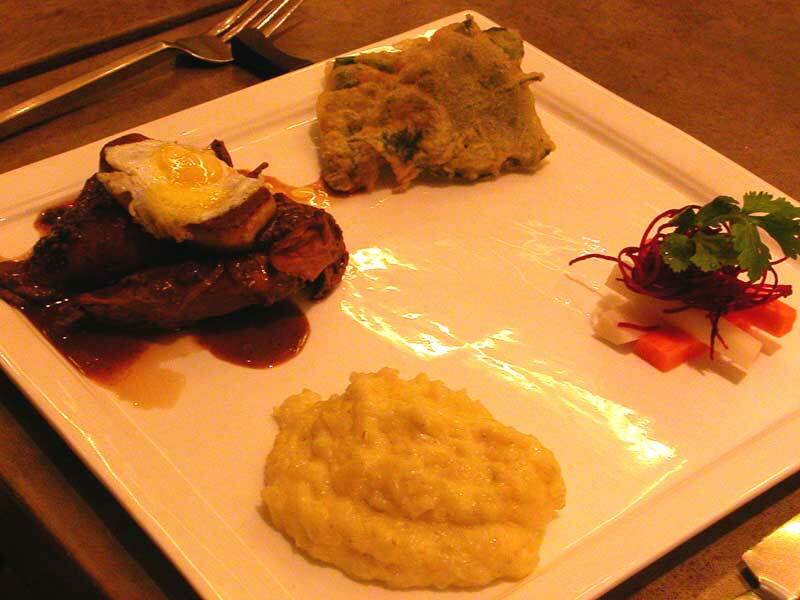 i didn't actually try this next dish, but it was very intriguing: chicken adobo with pan-seared foie gras and topped with a fried quail's egg, and served with a side of kangkong tempura and mashed potatoes. it looked a little crazy, but it smelled divine--i won't question it until i get to try it sometime. 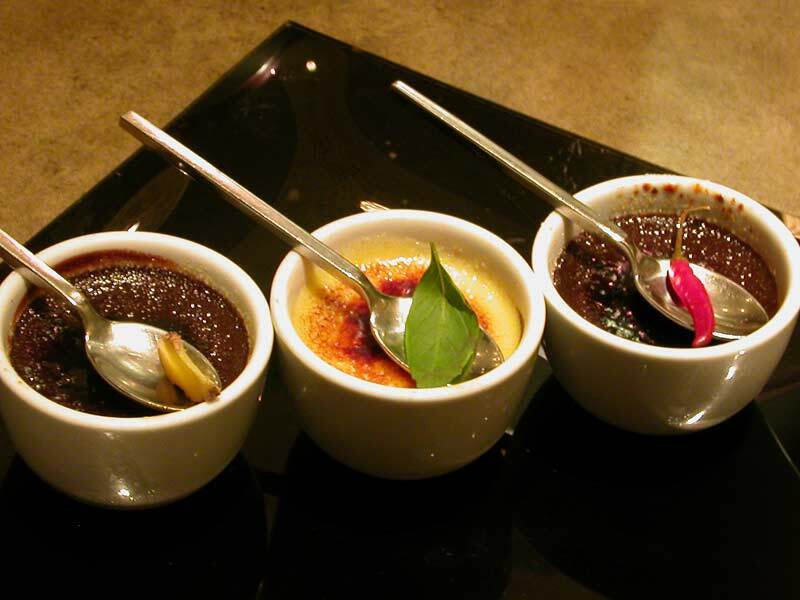 there were three chocolate crème brûlées: dark chocolate with ginger, white chocolate with thai basil, and dark chocolate with chili pepper. they were exquisitely done, with a thin but firm burnt sugar layer, a nicely done chocolate base, and the infused flavours subtle, yet with a kick that intensified with every bite. the majority of the table preferred the chocolate with chili, but i gave a slight edge to the almost anise-like thai basil one. heavenly. 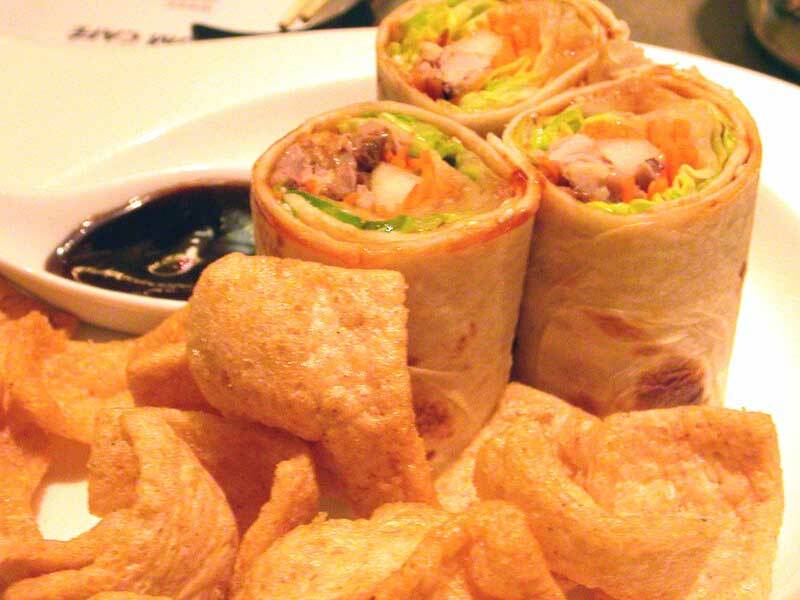 i like m café, despite my disappointment in a couple of dishes. service was decent, but some of the dishes arrived much later than others, and towards the end of the evening our server disappeared almost completely. 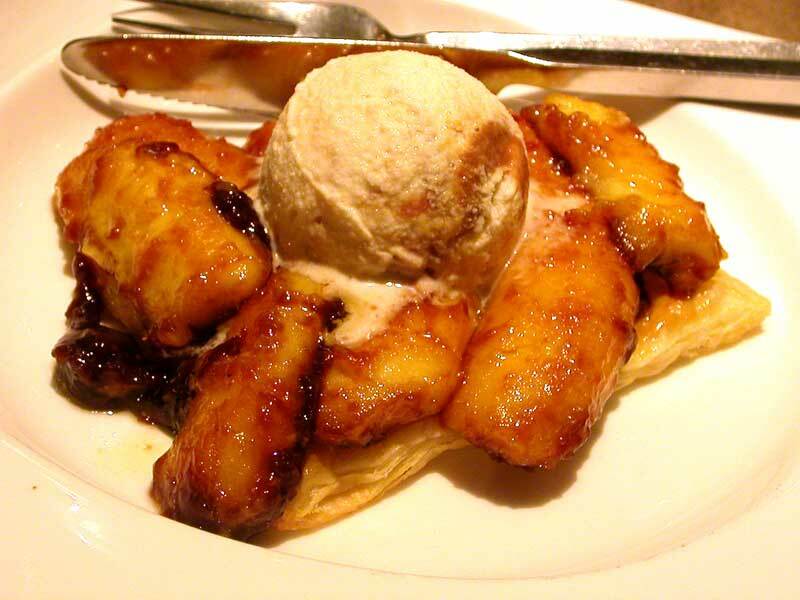 however, the room and atmosphere could have been cold and haughty, but it seemed like the staff and customers were a relatively genial bunch, and the warm scent of caramel wafting from the dessert bar helped immensely. it can be a little pricey for the philippines (entrees range from P250 to P595-US4.60 to US$10.80), for what could be a "nouvelle" amount of food. however, the lunch menu should be reasonable, and i'm rather excited by the fact that they open up at 6.30 am for breakfast. anybody care to join me for a chicken curry omelette or banana peanut butter waffles next time i'm in town? one of the reasons we usually went to greenhills is because of the chinese drugstore and the chinese deli/supermarket within the complex. unfortunately, the drugstore moved out, and the chinese deli burned down. sheeeeee--p. luckily, we found the new location for the deli, named DEC (pronounced as a word, but an acronym for "diao eng chay"), which is not too far away from greenhills. DEC is a family run commercial bakery that specializes in chinese and filipino steamed and baked pastries, and is fairly well known for their hopia and moon cakes (both are essentially flaky pastries with a mashed bean filling). 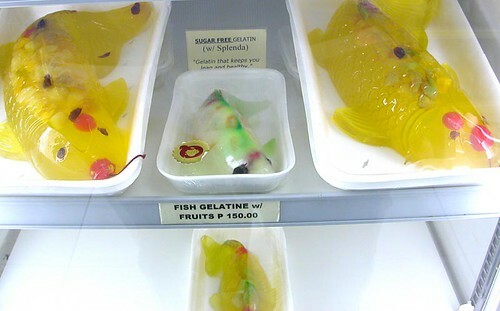 however, the family also has a couple small but popular deli/markets that have fresh and frozen dumplings, siopao and baos (filled buns), barbecued meats, a vast variety of cooked chinese dishes, and a vast array of pastries and sweets, from gulaman-based treats and sago-based ones (gelatin and tapioca), to flans and cheesecakes. 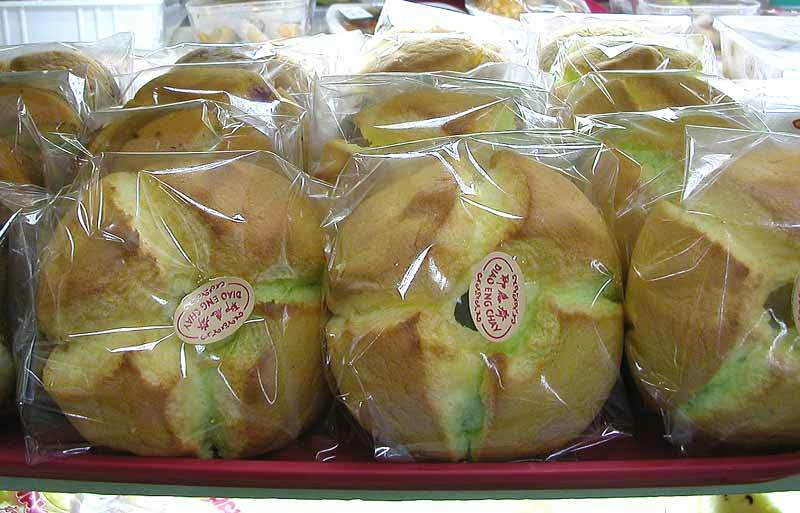 and of course, their own bakery goods. 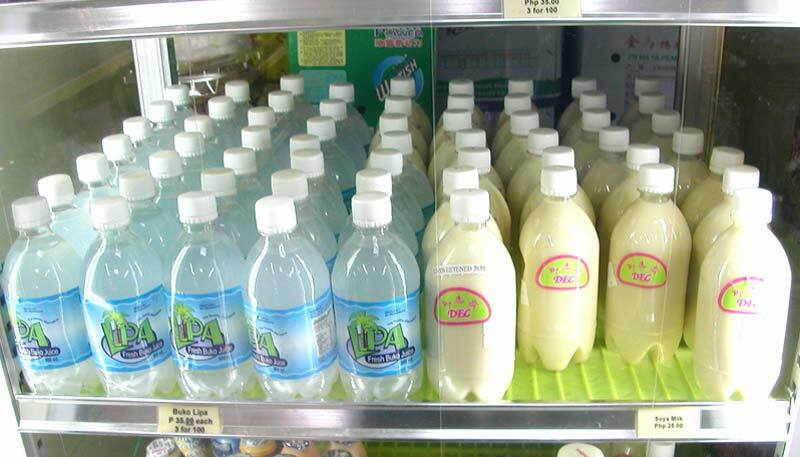 there are several things that set DEC apart from other delis for me, the main thing being that they have a large variety of fresh juices bottled daily, including fresh buko juice--the water from young coconuts--which has an incredibly short shelf life (2 days max). most commercial produced buko juices are stabilized with...something...somehow, and taste nothing like the real thing. the DEC kind (bottled by a company called lipa), is as close to a freshly cracked coconut as you are going to get in a bottle. i buy this stuff by the dozens, as not only is it quite tasty, but it is a natural form of gatorade, or any sports-type drink; since manila is so humid and warm, and i am constantly on the move, i find that sometimes water cannot quite quench my thirst, nor hydrate me the same way that buko juice can. 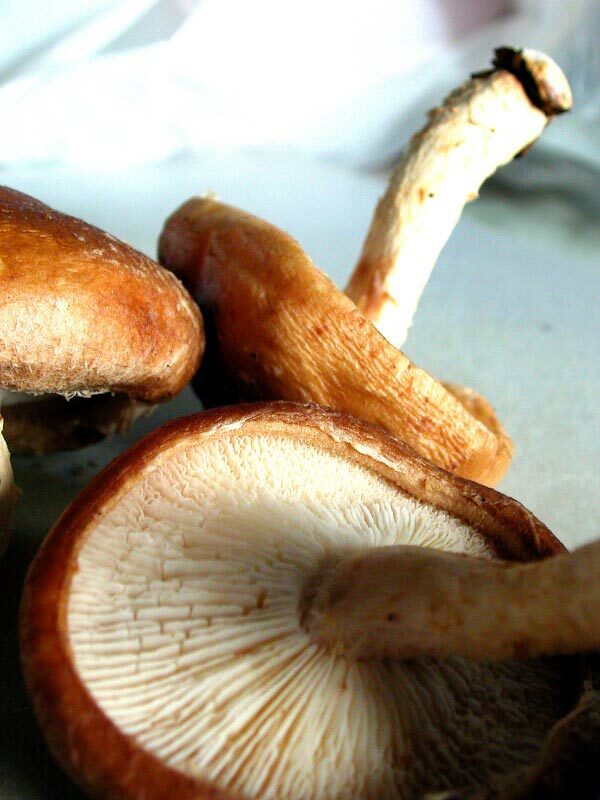 it's also a very good way of cleansing out toxins from your body, and helps in digestion. very handy. DEC also bottles fresh watermelon, avocado, citrus, and kiwi juice, their latest offering being a lovely citron "tea", which is made from the rind and pulp of fresh citron, and local honey. they also manufacture their own soy milk and have a very popular boba tapioca pearl shake counter. 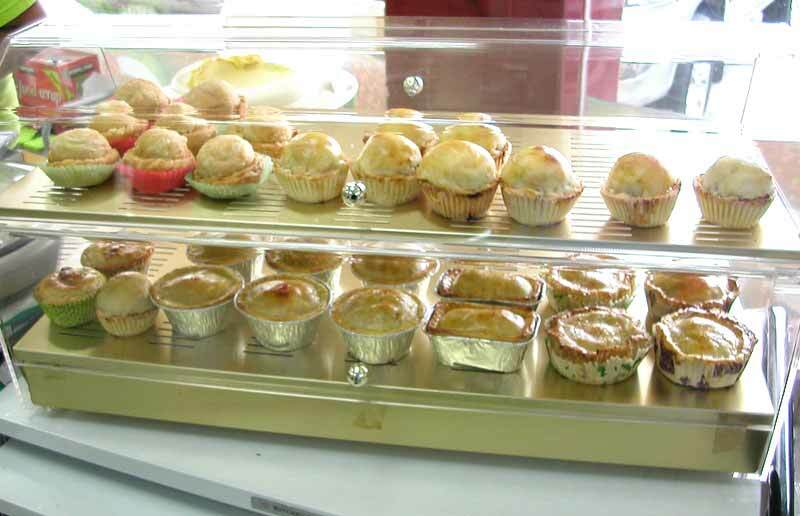 they also make little pot pies daily, with everything from a delicious taro and mushroom filling, seafood thermidors, to a very popular chicken a la king topped with a flaky, delicate crust. i would eat one of these every day if i lived nearby. i'd be the buddha sitting at the front door. rub my belly at your own risk. they stock a variety of packaged asian snacks, candies, and condiments, preserved fruit and vegetables (they have a really good sweet and spicy sampalok or tamarind, btw), frozen meats and seafoods, and fresh fruits. pretty much one stop shopping, as far as i'm concerned. 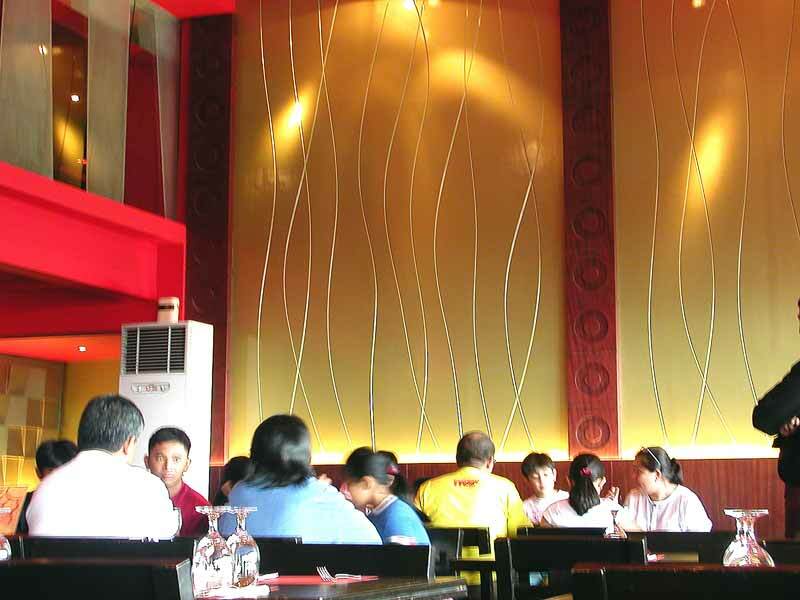 manila: lunch at little asia. guam is not that far away from manila, so we hit the ground running and pretty much went shopping immediately at the greenhills shopping complex when we arrived. although we shopped at the cheap and chaotic bazaar, we decided to have lunch at the adjoining promenade arcade, at a restaurant i believe is called little asia a symphony of flavours but i'll just call it little asia. i don't really know all that much about the restaurant itself, but it is the second outlet (the first is in quezon city) and it is partially owned by fabulously named siblings charlemagne, charlson and charlyn lim. the interior is contemporary, upscale, and comfortable but weirdly gave me an italian café vibe (i think it was the mural). the menu is ginormous, with dishes from all over southeast asia. unfortunately, i was with some non-adventurous cousins so i couldn't try the vietnamese crispy frogs' legs, sizzling balut (fertilized, incubated duck eggs) in a savoury onion sauce, and deep-fried fish bones, but what we did order was good overall, with a couple of outstanding dishes. sorry for the blurry photos! we ordered steamed lapu-lapu (grouper, garoupa) fish fillets with tofu in a black bean sauce, kangkong (water spinach) sautéed with garlic, fried gabi (taro root) cake (pictured above), and honey fried shrimp. the gabi dish was excellent, although the gabi was unlike any taro cake i'd previously had. 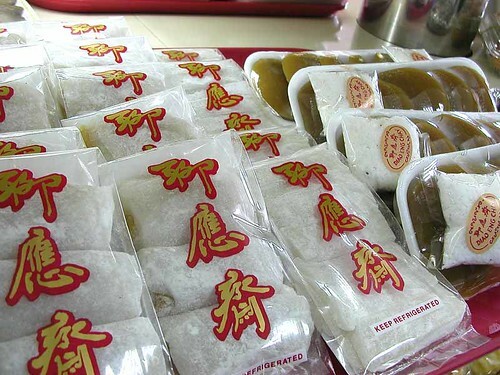 usually taro cake is made with boiled and mashed taro root, then steamed and fried, but this was taro mixed with glutinous rice flour, so it was a bit stickier, and the thin slices were deep-fried. 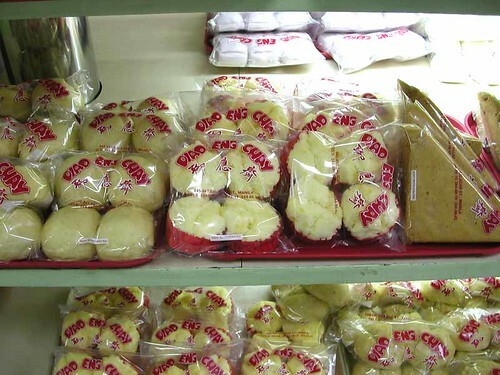 more like tikoy, but not sweet. 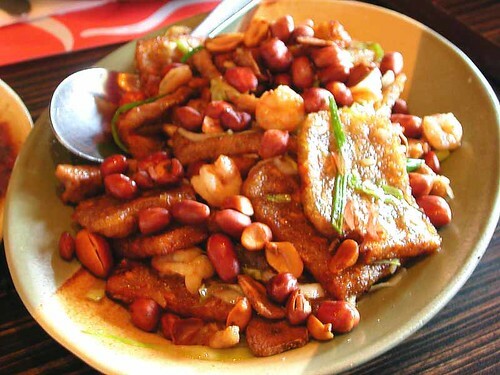 the pieces were further sautéed with small shrimp, whole cloves of pan-roasted garlic, green onions, and spanish peanuts. this dish was understandably a little oily, but not unpleasantly so. the shrimp was not what i imagined either. 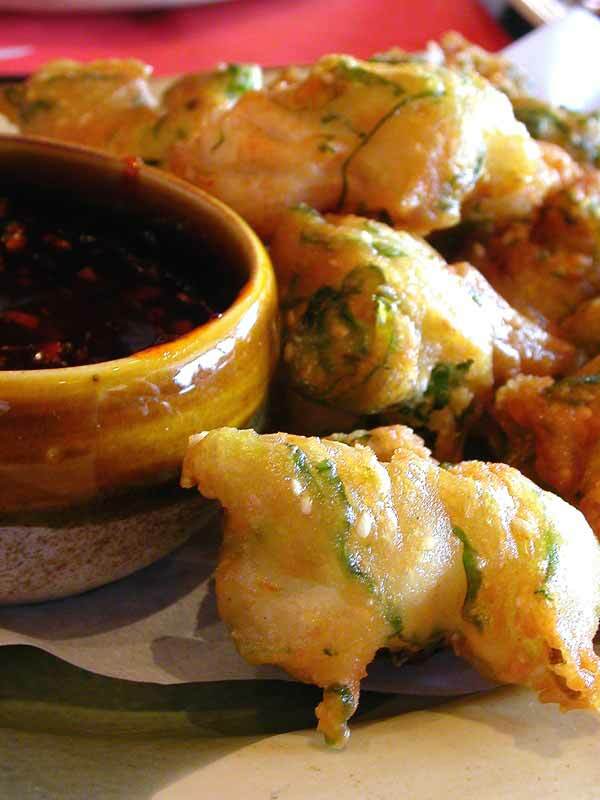 i had thought it would be something like that walnut shrimp dish with mayonnaise everyone seems to like but me, but these were whole prawns in a flour, egg white, and green onion batter served with a honey-chili-garlic sauce that was downright jammy, but very, very good. 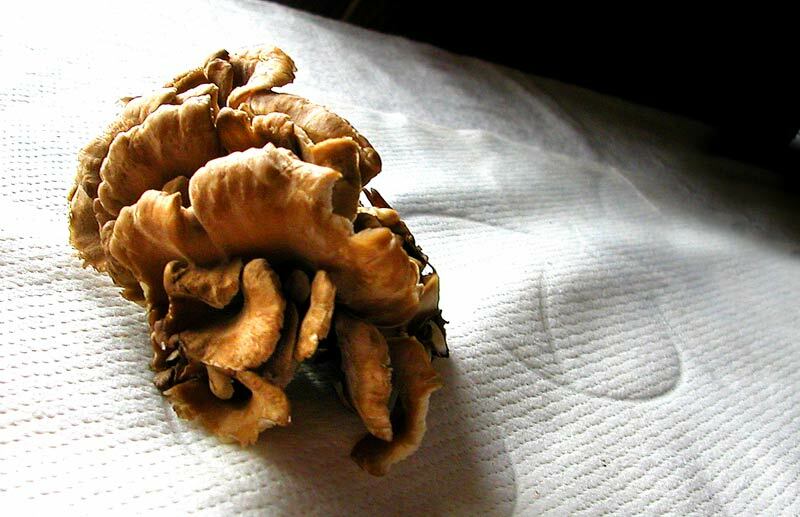 the puffs were exceptionally light and crispy, with a perfectly seasoned and cooked prawn within. the puffs were so well cooked that there wasn't a trace of grease on them when they arrived at the table piping hot, and they stayed perfectly crispy the next day when i ate the leftovers for breakfast. :) now *that's* a breakfast of champions i tell you. portions are generous (each dish fed four of us adequately) and the prices ridiculously reasonable to just reasonable, depending on what country you live in (mostly from P165 to P325--as of today the exchange rate is P56=US$1, so that's about US$2.94 to US$5.80). 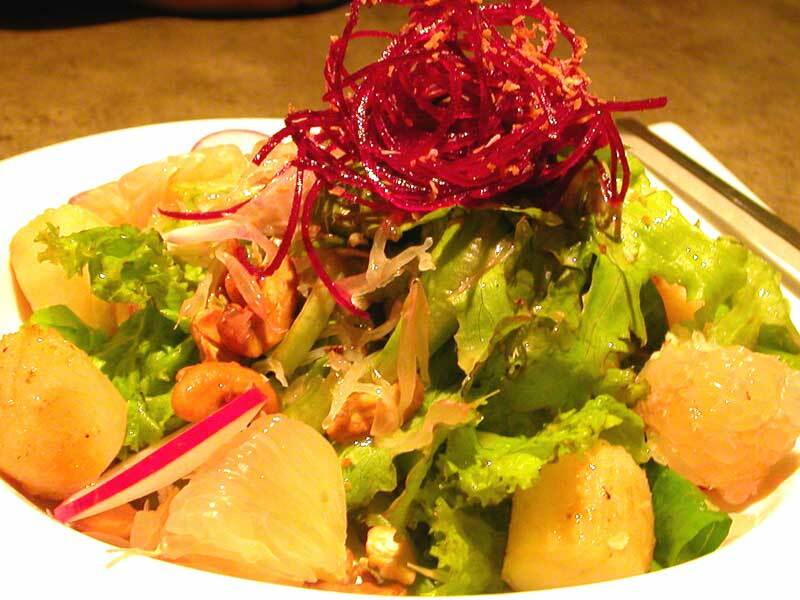 service is excellent, the clientele mostly family groups, and the food seems uniformly good overall. a confession: i didn't really sit on the sofa all that much. and i didn't get a haircut. i'll be away from the internets. 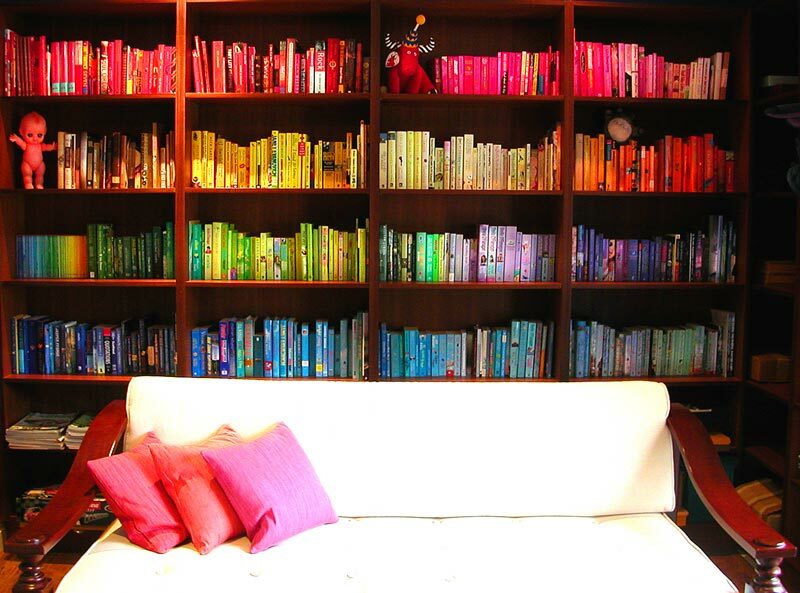 i have some books to read, that sofa to sit on, and a haircut to be had. should be done in a week or so. see ya! an evocative food blogging event for all filipinos. read about it on the pilgrim's pots and pans. 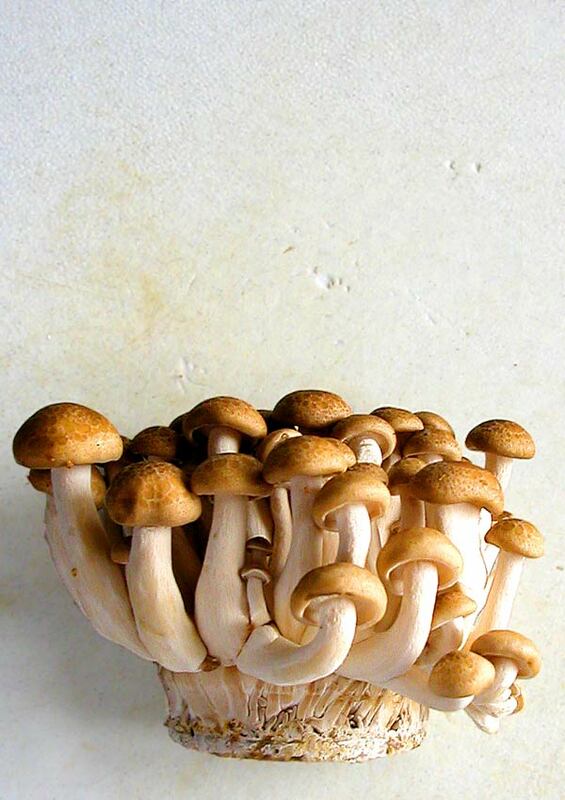 how to make a clump of mushrooms happy. 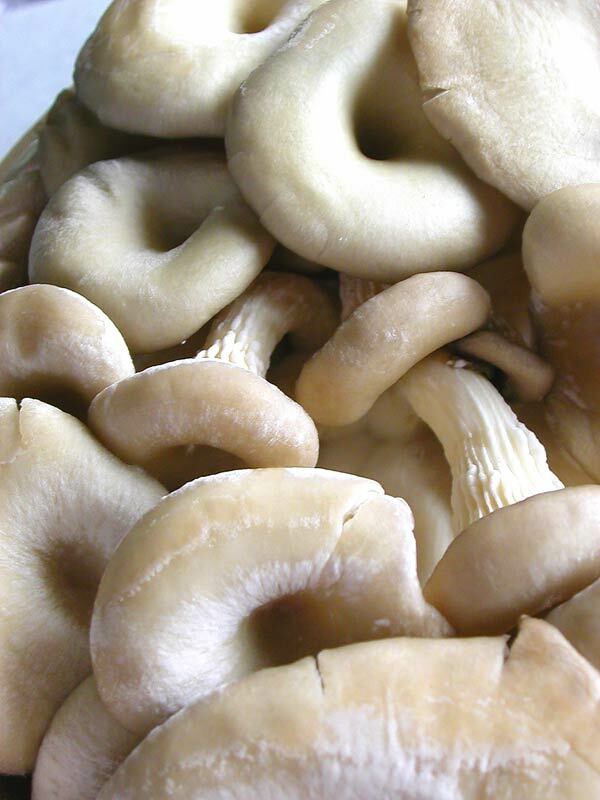 white buna-shimeji mushrooms, hypsizygus tessulatus, common name: beech mushrooms.